The Nutroll: The Illness teaser page is done and uploaded to the site. Finally. By finished, I mean that my shambling, bloodstained shell of flesh limped to the finish line with this thing because nearly everything on this damned planet was trying to keep me from doing this. The sketchbook with layouts for pages 1 through 3 is one of the only two things that I haven’t found since having to move in February. The other thing? G.I. JOE the Animated Movie on DVD. In other words, fate decided that I should stop “Nutroll: the Illness” at the teaser and that I should be denied the glory of watching Big Lob make his move. People seem to like the teaser so far and that seals the fact that I should just leave it as a teaser until I find the original layouts for the next few pages. Besides, I have some website and commission artwork to do now. Here’s the Thank You pic drawn to show my appreciation for 20,000 visits to Illmosis’ front page. Not bad considering how many people go straight to the galleries instead of the index page. Oh-damn-well. 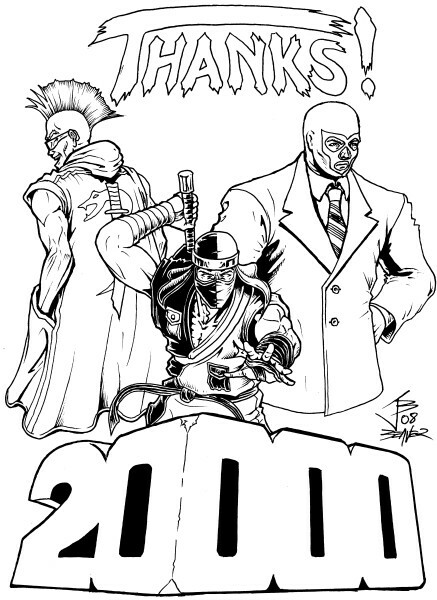 The theme of the picture is “two” and features Two.P from Capcom’s Final Fight, my character Twofold and the ultra-legendary Mr. Wrestling #2. I wanted to draw a bigger piece that also had Duo Damsel, Jack-2 from Tekken 2, Two-Bad from Masters of the Universe, the Two-Gun Kid, the evil twin brothers Tomax and Xamot from G.I.JOE and Two-Face. Between all the work I’d put into the comic and my sinus problems getting bad enough to make my head throb, I cut it down to 3 characters with outfits that had a nice place to stop before getting to the legs. That’s why Mr. Wrestling #2 is in a suit. Plus, I’d never drawn a masked wrestler in a suit, one of the coolest visuals known to the frail eyes of mankind. Two.P is there because I can’t think of a reason to not draw Two.P when the chance makes itself known AND I could cut him off at the bottom of the coat. Not that you asked, but still.